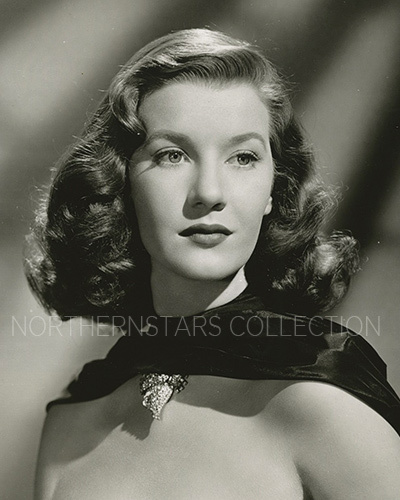 This photo of Lois Maxwell was scanned from an original in the Northernstars Collection. Lois Maxwell’s film career began when she was only 19 in A Matter of Life and Death. She was given The Most Promising Newcomer Award at the Golden Globes in 1947 for her role in That Hagen Girl. She is usually remembered for her many appearances as the efficient Miss Moneypenny in the the first 14 James Bond films produced between 1962 and 1985 when she was dropped in favour of someone younger. She died of cancer in hospital in Australia. The photo above and the poster below were scanned from originals in the Northernstars Collection. 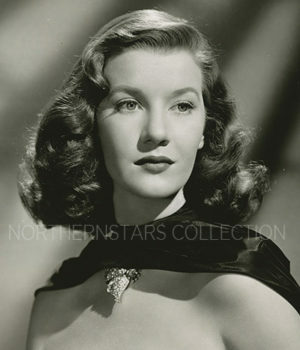 The photo of Lois Maxwell came with an attached note from Warner Bros. Pictures Inc., which reads in part “Lois Maxwell, titian-tressed newcomer to Hollywood, discovered in London by Sophie Rosenstein of the Talent department at Warner Bros., and signed by J.L.Warner while he was in Europe. Passport to Treason costarring Rod Cameron and Lois Maxwell was scanned from an original in The Northernstars Collection.